This is the second of four planned posts about Kristin’s and my recent cruise trip. A few days ago I posted an overview of the cruise itself. Now I want to tell you about why Kristin and I were there, specifically. 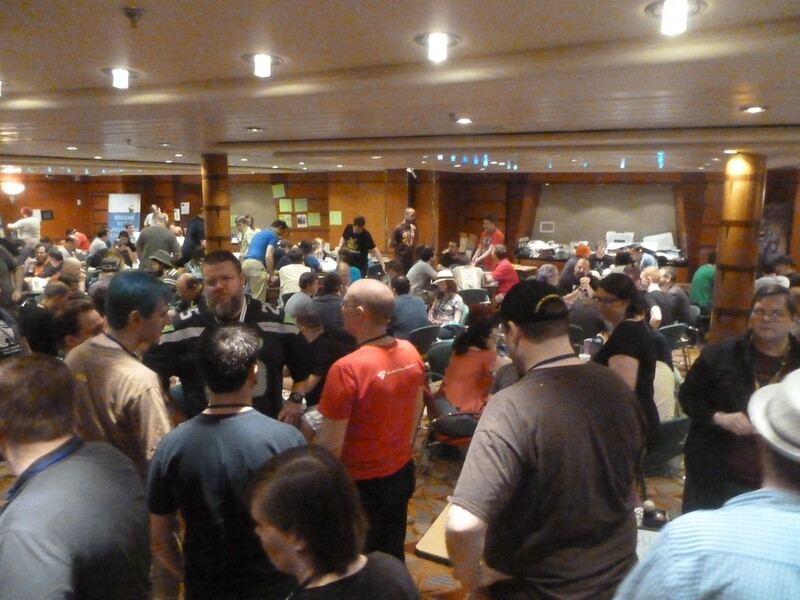 As I mentioned, there were 900 geeks on this boat and a 24/7 gaming room, fully stocked. Sounds like a great place to get people interested in Looney Labs games, doesn’t it? Yeah, they thought so, too. Which is why they became one of the sponsors of the cruise and included pyramid games and rule books in all 900 swag bags. So… now that all the Sea Monkeys had pyramids, it was our job to make sure they had fun playing with them! So Kristin and I staffed three events. First, the Table Top Taste Test (which actually featured Loonacy). This was a chance for participants to learn new games and enter a raffle for the chance to play games with the celebrities. It was reported that over 200 people showed up! Next came Playing with Pyramids, a four-hour event in which we gave out Starship Cadet training booklets and challenged participants to become Starship Captains by learning ten pyramid games. You can see Leila on the left, me in the middle, and Kristin’s table (she’s taking the picture) on the right. The event was this busy for not only the scheduled four hours, but another two after that, and only ended because we insisted on going to dinner despite protests of those who wanted us to stay and teach them more. 🙂 I know of at least one person who learned ten games and earned his Starship Captainship all during this one event! 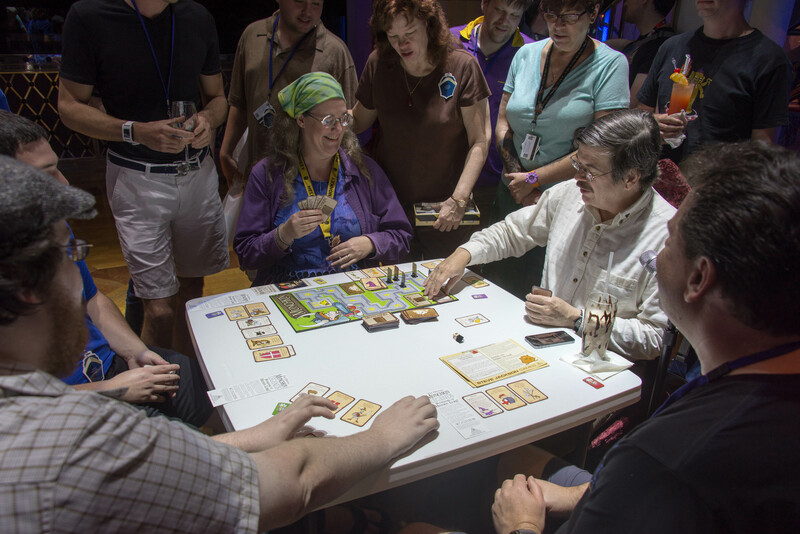 And Sage–the guy in the purple shirt in the photo–waited for hours for a chance to learn Homeworlds. Thanks for your patience, Sage! In addition to these planned events, Kristin also agreed to participate in a spur-of-the-moment “Quitting Panel,” as she had on a previous cruise. The Quitting Panel is a group of people who have quit their day jobs in order to go into business for themselves, and are willing to share their experiences with others who are considering doing the same. This event was well attended, with about 25-30 participants. And then there was the game playing outside of the scheduled events. We spent a lot of time in the game room, which was almost always packed, even at 2 in the morning! (Added bit of fun, Where’s Waldo style–can you find Kristin in this game room picture?) But the game room isn’t the only place we played games! I taught Thom Robinson (inventor of Artemis) to play Homeworlds in the Windjammer Cafe one day. And then there was Celebrity Munchkin. Remember that at the Table Top Taste Test you got to enter a raffle to play games with the celebrities? Well, one of those possibilities was playing Munchkin with inventor Steve Jackson. Kristin had admitted earlier in the cruise that she had never played Munchkin and would love it if Steve taught her, so he invited her to play her first game at the celebrity event! And, with the help of an advisor from the audience and an ally at the table, Kristin won! She gave the two prizes (valuable game cards) to her two helpers, so it was a win-win-win! Well, now you know why we were there. It really was a working vacation… but so much fun!! !